Ivan Barbashev is greeted by the Blues' bench after scoring in the first period. Five other Blues will find the net as well. ST. LOUIS — St. Louis Blues center Brayden Schenn is known for his offensive touch. He showed his physical side on Friday night. Ryan O’Reilly, Schenn and Alex Pietrangelo finished with a goal and an assist, and the Blues snapped a three-game losing streak with a 6-2 victory over the Nashville Predators. Ivan Barbashev, Zach Sanford and Robby Fabbri also scored for the Blues, who posted their highest goal total in 11 games. Robert Thomas had a pair of assists, and Jake Allen made 26 saves as interim head coach Craig Berube earned his first win since taking over after Mike Yeo was fired on Monday night. The Blues scored the first two goals of the game and never trailed, splitting a home-and-home with the Predators after losing at Nashville on Wednesday. 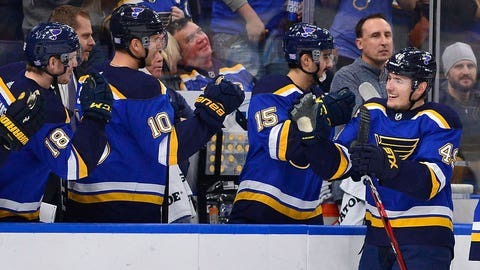 But it was two fights, one between the Blues’ Pat Maroon and Austin Watson and the other between Schenn and Hartman in the game’s first 75 seconds that set the tone. Nick Bonino and Ryan Hartman scored for the Predators, who had their three-game winning streak snapped. Juuse Saros was pulled in favor of Pekka Rinne after giving up five goals on 15 shots. Barbashev finished on a give-and-go with Jordan Schmaltz that resulted from a Miikka Salomaki turnover, giving the Blues a 1-0 lead midway through the first period. It was the first time in six games that St. Louis got the opening goal, a streak that dated to Nov. 10. O’Reilly made it 2-0 Blues with 6:51 left in the first, marking St. Louis’ first multi-goal game in their last five contests. Bonino’s power-play goal for the Predators cut the deficit to 2-1 with 5:48 left in the first. It was Nashville’s first shot on goal. “They had a coaching change and we knew they were going to come out hard, especially at home and we didn’t match that tonight,” Predators defenseman Roman Josi said. Schenn answered 67 seconds later on a breakaway to make it 3-1 Blues. Sanford gave the Blues a 4-1 lead 46 seconds into the second off a feed from O’Reilly. It was Sanford’s first goal in 11 games, dating to Oct. 27. Fabbri made it 5-1 Blues with 8:07 left in the second. Fabbri’s first goal in eight games chased Saros. It was the most goals the Predators have allowed this season. Nashville center Kyle Turris left the game in the first period, but the team gave no update after the game. NOTES: Predators G Pekka Rinne won his 320th career game on Wednesday, passing Miikka Kiprusoff for most wins by a Finnish-born goalie in NHL history. . Blues F Robert Thomas scored his first NHL goal on Wednesday, becoming the fourth-youngest player in franchise history to score a goal at 19 years, 142 days. . The Predators scratched C Zac Rinaldo and D Matt Irwin. . The Blues scratched D Carl Gunnarsson, LW Alexander Steen and RW Nikita Soshkinov. Nashville: Hosts Anaheim on Sunday. St. Louis: Hosts Winnipeg on Saturday.